Roads have stories. Walking to school used to be a daunting experience on this road for the 3,000 students on their way to Justin Kabwe Primary School, Lusaka, Zambia. Drivers would speed past and there was no crossing, so the children would dodge between cars, hoping that they had judged the distance correctly. Sometimes students from the school were hit and injured by speeding vehicles. The most dangerous time of day was the peak morning time, when an average of 652 vehicles and 1,610 pedestrians per hour were all trying to reach their destinations. In 2017, NGO Amend and its partners assessed the area outside the school. They identified simple measures that would slow the traffic down and enable pedestrians to cross the road safely. 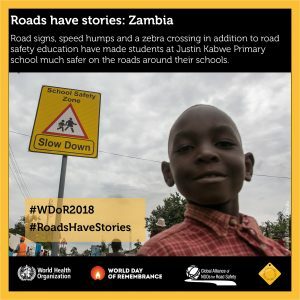 The measures weren’t complicated or expensive: signs instructing drivers to slow down in front of the school, speed humps, and a zebra crossing, plus road safety education, teaching the children to be safe and responsible on the road. The new safety measures have made a big difference. Driving slower makes the roads safer for all, especially pedestrians. The more you speed, the higher the risk of a crash and the severity of crash consequences. A 5% reduction in average speed can result in a 30% reduction in the number of fatal crashes. Read more about Amend and their SARSAI schools program HERE.